The gf and I bought art. At a craft fair. Actually, for all you local readers, there is the 3rd rated craft fair in the country going on right now in Northampton, MA. Monday too! While there is a cover of $8-10 dollars, there are online coupons and the place is really just a HUGE MUSEUM. And most of it is pricey. But not all. Anyway, the gf and i walked around at a pretty good pace and it still took us 2 hours just to cover the grounds. And that's not including the lobster roll i housed (not as good as the Cape, but WAY better than no lobster roll at all) and live music. And we bought something. Well, we were going to buy something, but then my parents bought it for us as an early bday gift (thanks m&d). So now we have art, and it makes me so so happy. Here is our new art rooting for Michigan football soon after arriving home (unfortunately it was not our art's first Michigan victory with us). For those of you who aren't experts at the removal of hats from pictures, i will describe our new art. 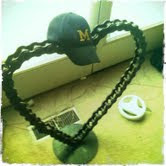 It is a heart, made out of what looks like an industrial sized bike chain. It's pretty big. The heart is, as my mother pointed out, not symmetrical. in what i can only describe as a moment of brilliance, my gf replied, "Love's not perfect." How well she knows me. The funny side story here is that the artist, who was a large sized guy (tall not fat) had a personality that was bubbly. Well, as bubbly as a 6 foot 5 lumberjack sized guy, can be. And as soon as we asked about the price of the heart sculpture, he started talking about how he knew this sculpture would be bought by some hopeless romantics. Almost everything he said to us after this point ended in hopeless romantic. I am not a hopeless romantic. I am decidedly hopeful as a person, and even more-so with love (cause i got lucky). But it became obvious that the sculptor had his mind set on where his heart should be going, and i didn't want to disappoint him. The piece is pretty heavy, and the artist volunteered to carry it to the car for us (because on my back surgery, i felt it best to accept the offer--gf had to pull her car around). As he walked our art through the fair, he stopped at probably 7 or 9 different stations, every time saying, "this was bought by some hopeless romantics . . . Look what some hopeless romantic's jsut bought." It was juuuuuust starting to get a little creepy when we got to the tent's entrance/exit. He obviously loves love. And he seems like a genuinely happy-go-lucky guy. I may not be a hopeless romantic, but im not so jaded that i can't enjoy his hopeless romance with our art/love.